Relive the story of the 2013 anime. Koei Tecmo and Omega Force have released first details and high-resolution screenshots of its Attack on Titan game for PlayStation 4, PlayStation 3, and PS Vita, due out this winter in Japan and 2016 in North America and Europe. The game’s main mode will cover the story of the entire 2013 anime, and a number of scenarios that place the spotlight on popular characters are also being developed. The same voice actors from the anime will also return to represent their characters. Get the game feature outline below. In a cruel battlefield where the state of battle is constantly changing, the result of the player’s strategy has a direct connection to moving forward. In a game that offers high tactical freedom, the thrill of hunting action and fighting giant bosses are fused together to provide a new sense of battle never seen before in a video game. Depending on the tactical situation, you can proceed slowly and carefully or challenge the titan without warning. The player’s actions affect the direction of battle in a big way. This is hunting action in a new form. Players can make full use of the 3D Maneuver Gear to zip freely around the sky and battle titans. By using type of action, you can rush quickly to companions in a pinch, and at times, it will attract the attention of enemies and they’ll run through the battlefield. In order to defeat a titan, it is necessary to attack its “nape.” To do this, you’ll need to attack from high altitudes and defeat titans by first destroying body parts like arms and legs, and then driving your blade into the titan’s nape. With this introduction of body part destruction, a higher level of strategic action is added to the game. Just like the original work, each character has a purpose and fights titans on a vast battlefield, and the state of battle rapidly changes according to this. Additionally, there will be changes within the city, such as walls and roofs collapsing as a result of battle, and it may affect the range of action players can take. The state of battle is constantly changing and the feeling of tension is high. A large number of scenarios that place the spotlight on popular characters are being prepared to develop the game’s dramatic story. It should appeal strongly to fans of the original work. In this game, players will relive the deep story of the Attack on Titan anime. 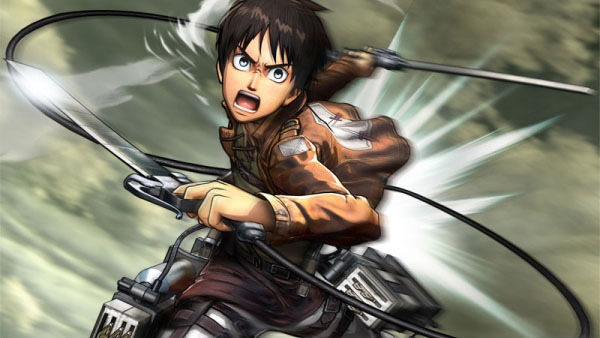 Characters such as Eren, Mikasa, and so on that were key to the original story will appear, of course, and their voice actors are the same as they were in the anime. Additionally, the “Physics Toon Shader,” the game’s newly developed graphical representation, offers original graphics with the theme of “fusing the anime world and game world.” As a result, you can play the game feeling like you’re freely controlling a character in the anime.